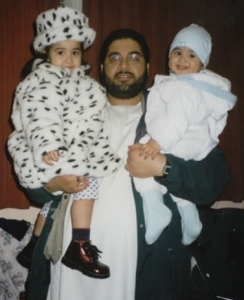 Shaker Aamer is a Saudi Arabian citizen with Permanent Resident status in Britain. Mr. Aamer was born and raised in Medina in Saudi Arabia. He left the country at the age of 17, living and travelling in America, Europe and the Middle East. He moved to the United Kingdom in 1996 where he met his British wife, Zin. 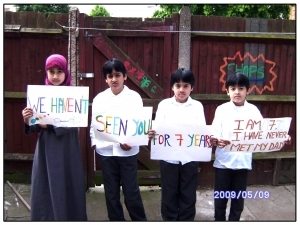 They married in 1997 and have four British children, all of whom live with their mother in Battersea, South London. Aamer has never met his youngest son Faris, who was born after his imprisonment. He is the last British resident held by the United States in the Guantanamo Bay detention camps, in Cuba. Aamer was captured in Jalalabad, Afghanistan, on 24 November 2001 accused of being a “recruiter, financier, and facilitator” for Al-Qaeda. In reality he was there doing charity work; building a girl's school. All of these allegations have subsequently been dropped. Clive Stafford Smith of Reprieve said the evidence against his client "would not stand up in court". He pointed out that part of the evidence came from Yasim Muhammed Basardah, another Guantanamo detainee, under torture and having been "promised all sorts of things". Shaker Aamer was brought to Guantánamo on 14 February 2002 and has been described by numerous former detainees as an unofficial spokesperson for the prisoners there. He is charismatic and spoke up for the welfare of other prisoners, negotiating with camp commanders and organizing protests against cruel treatment.